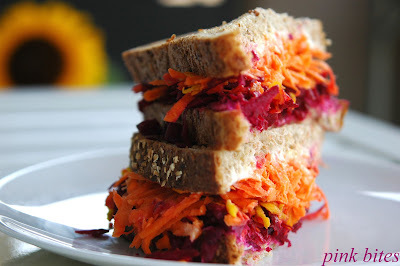 This is a really simple and delicious sandwich idea, perfect to take to work. 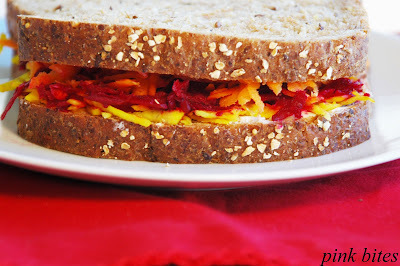 Sandwiches like this one are really common in Brazil but I find that most people here in Seattle prefer to use cooked beets and even then they are not very present in sandwiches. For this recipe, two types of raw beets plus carrots are shredded and then combined with goat cheese and herbs. The mayonnaise is used here to moisten the sandwich. You can add sliced tomatoes if you like. Coat bread slices with mayonnaise and goat cheese, sprinkle the chives on top, top it with the vegetables and close. This sandwich can be made in advance, wrapped in plastic or foil and refrigerated.